Ireland’s Rob Kearney in action against France during the World Cup Pool D encounter in Cardiff. Totemic lock O’Connell will retire from Test rugby at the end of Ireland‘s World Cup campaign, but will surely now miss the rest of the tournament. 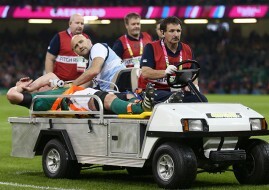 Ireland’s Paul O’Connell is stretchered off after receiving a serious leg injury during the Rugby World Cup match at Millennium Stadium, Cardiff. Madigan stepped out of Sexton’s shadow in fine style too, bossing Ireland‘s line with poise and authority, while O’Brien and Robbie Henshaw turned in performances critical to this win. Irrespective of whether the citing commissioners review the incident, O’Brien set Ireland‘s tone, with Pape prone on the turf for several minutes. France rejected a shot at goal in favour of kicking to the corner, only for Ireland to force a choke-tackle turnover. Frederic Michalak fluffed his first effort from the tee, before chipping his second against the post. Sexton had no such nervous affliction when handing Ireland a three-point lead after chipping the line and causing chaos in the French defence. Scott Spedding and Sexton traded penalties for six points apiece, before Ireland‘s backline general was forced out of action. France spent all week threatening to take Sexton out of the game, and the former Racing Metro playmaker lasted just 24 minutes. Number eight Picamoles’ thundering hit left Sexton prostrate on the field, before he trudged off disconsolately, hiding his face with his shirt. Sexton’s departure threw Madigan to the wolves, but the Leinster fly-half fired a penalty to calm any nerves and edge Ireland 9-6 ahead. Ireland shredded the French line with Tommy Bowe searing clear before seeming to fire the scoring pass to Keith Earls. Somehow Earls lost the ball amid a full-tilt juggling act however, letting France hugely off the hook. Rob Kearney’s dummy run dragged the space for Bowe to scythe through, and Earls had effectively fielded the pass before relinquishing control. An emboldened France attacked with new fervour, only for Rory Best to produce a textbook turnover penalty, forcing Thierry Dusautoir to hold on illegally. Madigan’s overzealous punt went out on the full and gifted France field position just when the half should have been up, handing Ireland needlessly nervy ending. Robbie Henshaw pulled off a desperate turnover penalty just yards from his line to stave off the attack, but in the build-up talisman O’Connell suffered either knee ligament damage or a torn hamstring. While every other player jogged down the tunnel, O’Connell received lengthy treatment on the field, before being removed via stretcher. Ireland refused to relent on their stunning intensity after the turnaround, Iain Henderson replacing O’Connell and centre Henshaw maintaining his pivotal performance. The Connacht battering-ram stepped his way through France’s line before finding Bowe with a ball over the top. France knocked on in a try-line scramble, and from the scrum Rob Kearney powered home for the game’s first try. The French simply could not credit Ireland‘s fervour, captain Dusautoir’s shocked face following a knock-on under zero pressure an indictment of the men in green’s increasing dominance. Morgan Parra nudged a penalty to reduced Ireland‘s lead to just five points just past the hour-mark, teeing up a nervy final quarter. France attacked again but O’Brien forced a fine turnover, before Ireland fired through the phases from a penalty lineout. Rory Best powered close, then Murray nipped home – cleverly placing the ball against the post to claim the try. Madigan’s conversion put Ireland 21-9 to the good, before the Leinster playmaker posted a penalty to seal the deal. For Ireland this was a victory to reverberate across the tournament almost as resoundingly as the din rebounded off the closed roof of a rocking Millennium Stadium.